The Dubai World Cup Carnival, worth $40m in prize money, runs from January to March every year and is a season of high-class international race days contested by the most high-profile owners, trainers, horses and jockeys in the world. Spread across 11 race days, the Dubai World Cup Carnival leads to the season-ending Dubai World Cup sponsored by Emirates. 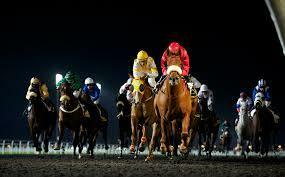 The Carnival runs alongside our domestic Racing at Meydan season. The major prep for Dubai World Cup day is Super Saturday. It is held three weeks prior to the big day and allows trainers to put the finishing touches to their equine stars before they take to racing’s biggest stage on Dubai World Cup day. As the official dress rehearsal for the Dubai World Cup it is a major social occasion in its own right. Spectators can gain free access to Meydan on a regular racenight or indulge in a range of viewing options to suit any budget and level of luxury from simple seating to five-star all-inclusive dining.